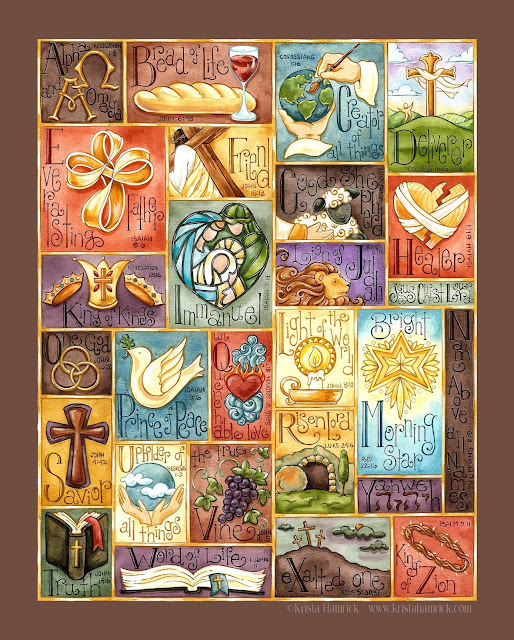 Krista Hamrick’s beautiful original art print, Name Above All Names Alphabet, has so inspired me. Each of the 26 individual Names she has identified are so special, as Krista has intricately painted, almost like stained glass windows, each one with its Scripture reference. Krista has said, “This is probably the painting that I have most enjoyed researching, designing, redesigning and painting. 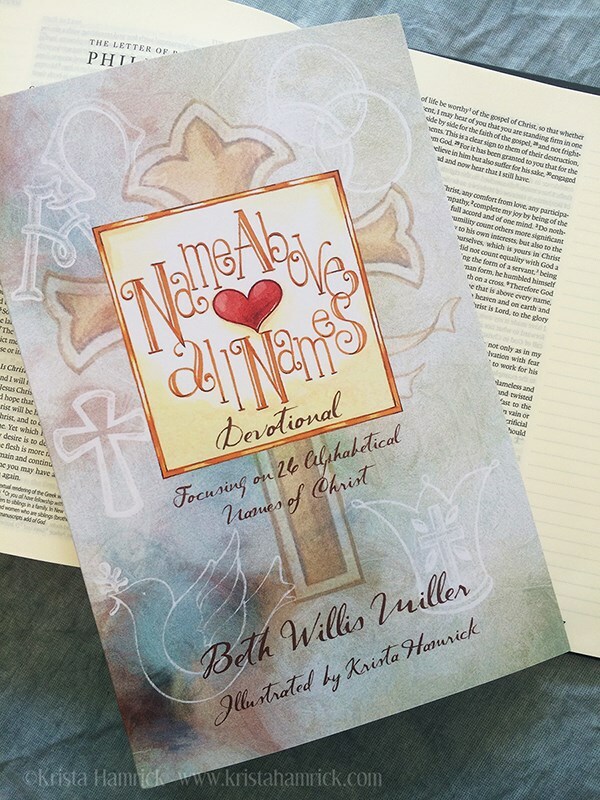 Beth Willis Miller has expanded upon each name with devotional word studies. By knowing, believing and trusting who God says He is, we can be confident in who He has created us to be.” I so agree with Krista! My heart has been drawn to do a word study for each of the names included in her art print. Krista and I felt led to publish our Name Above All Names Devotional: Focusing on 26 Alphabetical Names of Christ …available now on Amazon as a softcover book and as a Kindle book at this link. Combining the beauty of Krista's artistic excellence with these word study devotionals is perfect for individual quiet reflection or small group Bible studies focusing on the Name Above All Names—Jesus Christ—and His attributes and characteristics. Look up – Meditate on the name and what it reveals about the character of God. Look out – Let the nature of God impact on every relationship, for your good, and for His glory. NASB: What was from the beginning, what we have heard, what we have seen with our eyes, what we have looked at and touched with our hands, concerning the Word of Life. Amplified:﻿ [WE ARE writing] about the Word of Life [in] Him Who existed from the beginning, Whom we have heard, Whom we have seen with our [own] eyes, Whom we have gazed upon [for ourselves] and have touched with our [own] hands. ESV: That which was from the beginning, which we have heard, which we have seen with our eyes, which we looked upon and have touched with our hands, concerning the word of life. KJV: That which was from the beginning, which we have heard, which we have seen with our eyes, which we have looked upon, and our hands have handled, of the Word of life. NLT: We proclaim to you the one who existed from the beginning,* whom we have heard and seen. We saw him with our own eyes and touched him with our own hands. He is the Word of life. J. B. Phillips: We are writing to you about something which has always existed yet which we ourselves actually saw and heard: something which we had an opportunity to observe closely and even to hold in our hands, and yet, as we know now, was something of the very Word of life himself! Wuest: That which was from the beginning, that which we have heard with the present result that it is ringing in our ears, that which we have discerningly seen with our eyes with the present result that it is in our mind’s eye, that which we gazed upon as a spectacle, and our hands handled with a view to investigation, that which is concerning the Word of the life. Young's Literal: That which was from the beginning, that which we have heard, that which we have seen with our eyes, that which we did behold, and our hands did handle, concerning the Word of the Life. Pastor John Piper writes: “This is the best commentary on the first phrase of I John 1:1 …"That which was from the beginning..." "From the beginning" means, Christ our Life was when creation began. He is eternal. He had no beginning. He will have no ending. He is not part of creation. In the beginning He is the source of creation. All life comes from Him. He is the spring, not part of the river. "In the beginning was the Word, and the Word was with God and the Word was God. He was in the beginning with God; all things were made through him, and without him was not anything made that was made"
Word from the Greek logos which means to speak with words; logic, logical, it means something said and describes a communication whereby the mind finds expression in words. Lógos then is a general term for speaking, but always used for speaking with rational content. Lógos is a word uttered by the human voice which embodies an underlying concept or idea. When one has spoken the sum total of their thoughts concerning something, they have given to their hearer a total concept of that thing. Thus the word lógos conveys the idea of “a total concept” of anything. Lógos means the word or outward form by which the inward thought is expressed and made known. It can also refer to the inward thought or reason itself. Note then that lógos does not refer merely to a part of speech but to a concept or idea. In other words, in classical Greek, lógos never meant just a word in the grammatical sense as the mere name of a thing, but rather the thing referred to, the material, not the formal part. Author Dorothy Sayers writes: “[God] can exact nothing from man that He has not exacted from Himself. He has Himself gone through the whole of human experience, from the trivial irritations of family life and the cramping restrictions of hard work and lack of money to the worst horrors of pain and humiliation, defeat, despair, and death. When He was a man, He played the man. He was born in poverty and died in disgrace and thought it well worthwhile. The incarnation of Jesus Christ is the irrefutable proof that God will do anything to draw near to us." St. Augustine said, “[God] gave Himself for a time to be handled by the hands of men.” We have the written record of John, a man who actually did touch Him. We can trust his account—and we can trust that God wants to be near to you and me. The same God who created the expanse of the heavens, majestic mountains, glaciers, and everything else on earth and holds the whole world together by His powerful Word knows the number of hairs on our heads—and watchfully and lovingly cares about each one of us individually. This one truth is worth rejoicing about all day—God cares about me! I am of infinite value to Him. Nothing happens to me apart from His knowledge. He knows my name, my aches and struggles, and He loves me. We do not have to be afraid, for our Heavenly Father is watching over us. Our part is to stay connected by trusting Him. Lord Jesus, the Word of Life, thank You for Your tender, watchful care. Help me to remember all through the day that You are with me. You know every detail about my life—who I am, what I like, where I go—nothing is hidden from You. I rejoice because I have no need to be afraid. Your love for me means more than anything else in this world. May I go about my days with quiet confidence and peace, knowing that I am safe in Your hand. Thank You, Lord, for the assurance Your Word gives me that You reign over heaven and earth and that no one can thwart Your plans for my life—and for the whole world. I put my trust in You today. Only You understand everything—even those things that are mysteries to me. Because You have all authority on earth and in heaven, I can rest in You. When I am afraid, I trust in You, and I praise You for the sustaining power of Your Word. Help me to lay hold of Your words to me, for they alone bring me life, health, and peace. Thank You for the gift of Your Word, which comforts, inspires, and guides my path each day. In Your mighty Name Above All Names—the Word of Life, we pray, amen. Look In—as you meditate on I John 1:1 pray to see how you might apply it to your life. Look Out—as you meditate on I John 1:1 pray to see how you might apply it to your relationships with others. I'm you neighbor over at the 'Word of God Speak' link-up. I haven't been by in awhile, but love your word study. I particularly like what Pastor John Phillips says about thoughts remain invisible and inaudible until they are clothed in words...beautiful!! Always refreshing at your site! Thank you for stopping by, Bev! You are a wonderful encourager to me and so many others...many blessings to you! That is beautiful! Thanks for linking up for Wordless Wednesday! Have a terrific day! I love I John 1, and look forward to re-savoring its truth when I reach "W." Your book is such a beautiful setting for the jewel of God's truth. Great post and I really appreciate your prayer esp. where you remind us that nothing can thwart God's purposes. No matter how bad things look, God is still in control. Thanks for sharing. Blessings to you! I'm your neighbor at #TellHisStory. Thank you for these words that bring us back and hold us closer to God, and His undescribable love and persute of us. I am filled with the thought that words, while they cannot be touched, have the power to leave us hollow or fill us up. Thanks for these words that are filling. Ann, your kind words had the same effect on me today--very encouraging! Many blessings to you! Thanks for sharing this at Booknificent Thursday on Mommynificent.com! I am always encouraged by visiting your blog. Thank you so much for stopping by, Tina. 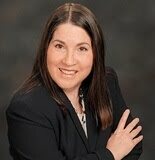 It is a joy to link up with the wonderful bloggers at Booknificent Thursday on Mommynificent.com! Many blessings to you!